Editor’s note: This article is part of “We the Immigrants,” a Community Based News Room (CBNR) series that examines how immigrant communities across the United States are responding to immigration policies. The five-part series is supported by a Solutions Journalism Network Renewing Democracy grant. Erika Suarez is tired of the lies, but she has no time to argue. Her family’s future is at stake in the United States. Suarez is one of the 704,000 DACA recipients living in limbo since the Trump administration announced an end to the Deferred Action for Childhood Arrivals program in September 2017. Erika, right, and her mother, Maria. 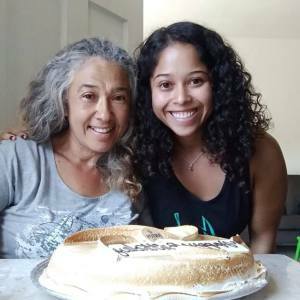 For Erika’s mother, Maria, 54, originally from Lourdes, El Salvador, life could come to a halt if Temporary Protected Status (TPS) is taken from her. She has been a TPS holder for almost 18 years and pays $495 to renew it every 18 months. Like many other Salvadorians, she immigrated to the United States because of economic and political turmoil in her home country and the devastating earthquakes in 2001 that left the country’s infrastructure broken. El Salvador was the first country to get TPS, a form of humanitarian legal relief designed to give temporary status and work authorization for immigrants fleeing war, conflict-ridden areas and natural disasters. Congress granted TPS through the Immigration Act of 1990 to protect Salvadorans escaping their country’s civil war. After the designation expired in 1992, the Bush administration gave El Salvador TPS again in 2001. Since then, the U.S. government has renewed the status and today provides TPS to over 300,000 people from 10 countries: El Salvador (195,000), Honduras (57,000), Haiti (50,000), Nepal (8,950), Syria (5,800), Nicaragua (2,550), Yemen (1,000), Sudan (450), Somalia (270) and South Sudan (75-200). In January 2018, President Trump announced plans to end TPS for four countries: Sudan, Nicaragua, Haiti and El Salvador. The expiration dates are fast approaching. Maria is scared that she could lose her job and, if sent back to El Salvador, would have difficulties finding employment because of her age. Maria has her work permit until September 2019. For now, a federal judge’s decision in San Francisco in October has blocked Trump’s plan to end TPS, giving Maria and impacted TPS holders a reprieve. But TPS is under more political scrutiny as over 7,000 people have fled Honduras, traveling north in a migrant caravan. The caravan—and whether to allow it into the United States—is creating a heated debate between anti-immigrant and immigrant advocates. What gets less attention is the U.S. role in the Honduran exodus and how American policy of economic development in Latin America has made poverty and violence worse. The United States has a long history of interventions that have caused instability in Latin America. During El Salvador’s civil war in the 1980s, the U.S. military funded and trained death squads. The U.S. opposed democratically elected Salvadorian governments, installing a right-wing government to commit butchery in a “dirty war.” U.S. allies kidnapped children from peasant settlements and sometimes forced them to fight guerrilla groups. The U.S. then sought to cover up human rights abuses. Many of these child soldiers fled to the U.S. and became involved in gangs, forming Mara Salvatrucha, or MS-13, a focal point in Trump’s fear-mongering campaign on immigration. When later deported, these immigrants became engaged in criminal activities, fueling the rise of MS-13 and gangs in El Salvador. Department of Homeland Security (DHS) Secretary Kirstjen Nielsen contends that TPS is supposed to be temporary and the program should end because conditions have improved for many of the affected countries. She suggests the quality of life in places like El Salvador is better. Immigrants from TPS countries tell a different story. Erika witnessed firsthand how the conditions have worsened in the region when she returned to El Salvador three years ago—her first time in her native country since she was 7. Even though she was happy to be in her “homeland” and see her father after 16 years, she was scared of the gang’s power. Pam, a TPS holder from Nepal, came to New York in 1994 when she was 26. She had to leave her young children behind for many years. After an earthquake in 2015 ravaged her country, she received TPS. She tried to adjust her status several times by paying a lawyer thousands of dollars, with no success. She now works in New York City as a nanny. Earlier this year, Pam was able to return to Nepal after applying for—and receiving—TPS parole to leave the country on a limited basis. She saw her now-adult children for the first time in 24 years. And she saw firsthand how dire the conditions in her home country remain. Immigrants with TPS status live throughout the country, with significant clusters in cities like Dallas, Phoenix, Miami, Los Angeles, San Francisco and Washington, D.C. Ending TPS will have a large impact on the local economy in these areas. In California, an estimated 55,000 TPS recipients—many from El Salvador and Honduras—contribute $2.4 billion in GDPannually. Some of them, like Maria, work in the service sector, with 14.5 percent of Salvadorans employed in accommodations and food service jobs, 14 percent working in construction, and 11.9 percent in administrative and support and waste management services. Suresh, a TPS holder originally from Nepal, lives in Dallas-Fort Worth and is ready to contribute. He has a bachelor’s degree in kinesiology from the University of North Texas and two master’s degrees from Amberton University in business and human relations. He was accepted into a doctoral program at Texas Woman’s University, but with cuts in funding to his research, he had to leave school after one semester. Because of his uncertain immigration status, Suresh works for FedEx with his wife. Nepalis were granted a one-year extension in April to arrange their departure after 23 U.S. senators wrote a letter to DHS, urging the continuation of TPS since almost 650,000 families in Nepal are without permanent housing due to earthquakes in 2015. On Aug. 17, 26 TPS recipients and community organizers boarded a bus from Los Angeles. 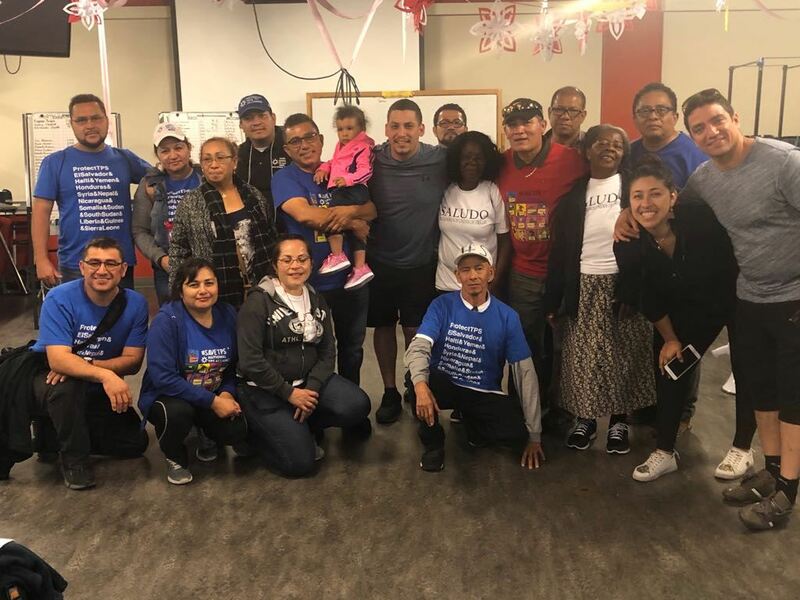 Their goal: travel through 50 cities nationwide in an effort to bring attention and advocate for TPS extensions and permanent residency at the national level. 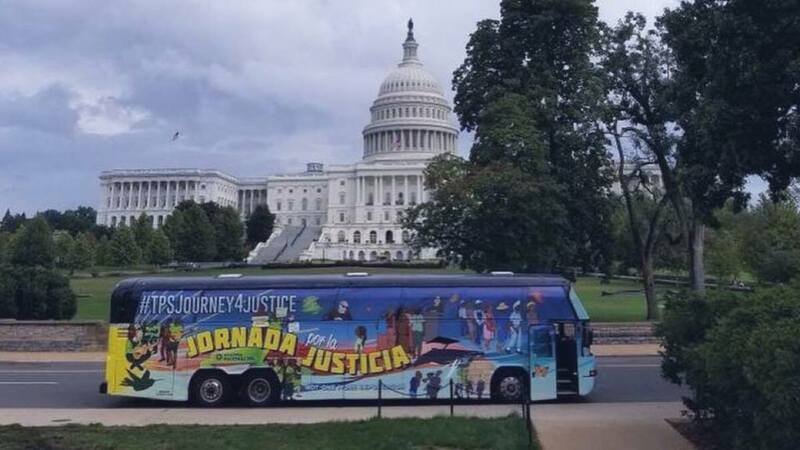 The tour, called the “Journey for Justice Caravan,” is an effort led by TPS holders with the National TPS Alliance. On that bus was Evelyn, 44, a TPS holder since 2001 and a veteran volunteer organizer with CARECEN, the Central American Resource Center. CARECEN Los Angeles, is one of many organizations helping immigrants advocate and develop TPS leadership around the country. Resistance is nothing new for Evelyn, who has been in the U.S. for 26 years and has three American-born children in college. In 2011, she went to a conference in Washington, D.C., to represent CARECEN as a volunteer. She was the only TPS holder. When she came back to Los Angeles, she increased her work with CARECEN to bring TPS issues to the national level. Efforts grew after Trump’s announcement to end TPS. The TPS Alliance now includes more than 40 different committees around the nation, all of them working on advocating for TPS. “While on the bus, our days were grueling,” Evelyn says. “We would often have to wake up at 2 a.m. or 3 a.m., so we could travel to more places.” Every two or three days, they were in a different region of the country. 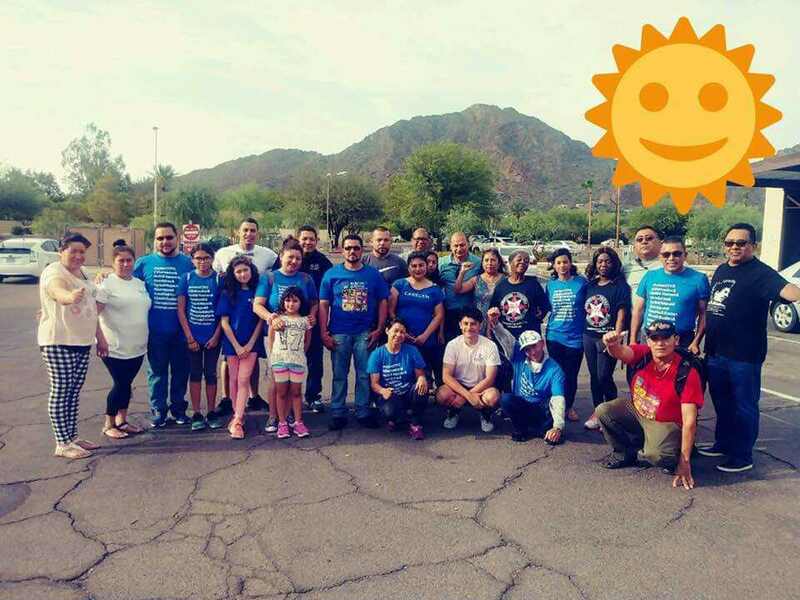 Evelyn, center, standing in the blue CARECEN shirt behind the person kneeling, in Phoenix with other Journey for Justice participants. Their first stop was in Phoenix, where they met with communities that were supporting local TPS work. The effort was a true collaboration. As challenges arose, assistance came from unexpected places. For six weeks, Evelyn traveled with the group and raised awareness. Evelyn, second from left, squatting, with the TPS caravan in Kansas. The group achieved its goal, traveling to over 50 cities in 30 states in 12 weeks, and helped advocate with a lawsuit that temporarily has halted TPS from ending. But the fight for permanent residency continues. There are several national conferences being planned after the elections in November. The TPS Alliance hopes that over 1,000 people will show up to advocate and learn new strategies to help make TPS permanent immigrants. They also are planning another gathering in February 2019 to do whatever it takes to make drastic changes. “We’re not going to stop fighting until Congress listens and makes changes in policy,” says Evelyn. 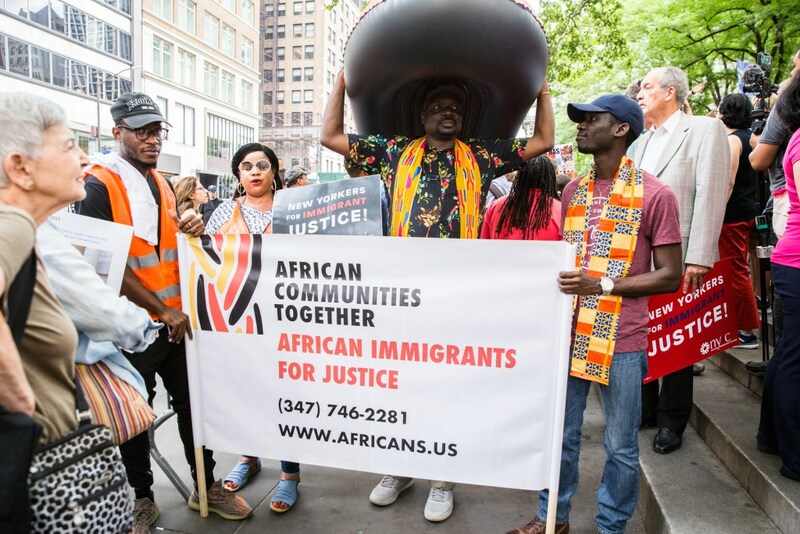 Another strategy used by TPS holders was a lawsuit coordinated with African Communities Together and other national organizations. 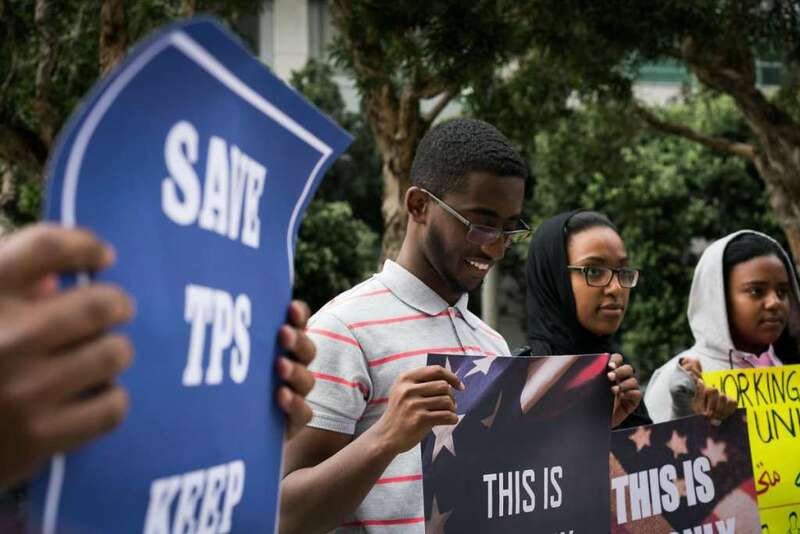 They have helped integrate and give resources to immigrants like Mazin Ahmed, 20, one of nine litigants and five children of TPS holders that sued the Trump administration to preserve TPS. African Communities Together on World Refugee Day. More than 273,000 U.S.-born children have parents who have benefited from TPS. If TPS ends, many of these children would either have to flee with their parents into a new country, be put into the foster care system or be put up for adoption as has been a common practice of children of deportees. Mazin Ahmed, left, participates in a TPS action in front of federal court. Ahmed grew up in Portland, Maine, and has been in the U.S. since he was 14 years old after coming from Sudan seeking refuge with his mother and brothers. Today, he is a third-year student at the University of Southern Maine. He is studying human biology and biochemistry, and plans on becoming a pediatrics doctor, if he is allowed to stay in the country. Suresh believes immigrants should be granted some type of more permanent status. He has lived in the United Status for over 17 years and has made a life for himself and his wife and young child, who was born in Texas four years ago. Adhikaar, meaning “rights” in Nepali, is a New York-based organization that is helping immigrants like Suresh and Pam advocate for permanent residency. But the Nepalese immigrants themselves are driving the organizational responses to TPS. Nepali organizing is new, but it is connected to long-standing traditions of activism with organizations like CARECEN, which has been organizing Central Americans since the 1980s. Adhikaar has been working with congressional representatives to push for two bills. One of the bills called the America’s Promise Act has gained bipartisan support and would allow TPS holders who have worked for over three years to seek permanent residency. Another bill by bipartisan legislators called ESPERER Act would grant green cards to TPS holders who came to the U.S. before 2011. The new legislative year will see how either of these bills pan out. Thousands of TPS workers in Washington, D.C., who clean and cook for policy workers—including those in the Trump administration and many departments in the federal government and hospitals—also will be affected if TPS is revoked. Unions like Service Employees International Union (SEIU) local 32BJ are joining the fight to keep TPS workers in the country. Half of its union membership of almost 18,000 janitors, maintenance workers and security officers in the D.C. area are from El Salvador, many with TPS. An estimated 5,700 TPS holders call Nevada their home and are members of the UNITE HERE Culinary Workers Union. Similar supportive actions by unions are happening nationwide. TPS holders who work on shipping docks as truck drivers and manufacturing workers joined actions with the Teamsters union in early October. 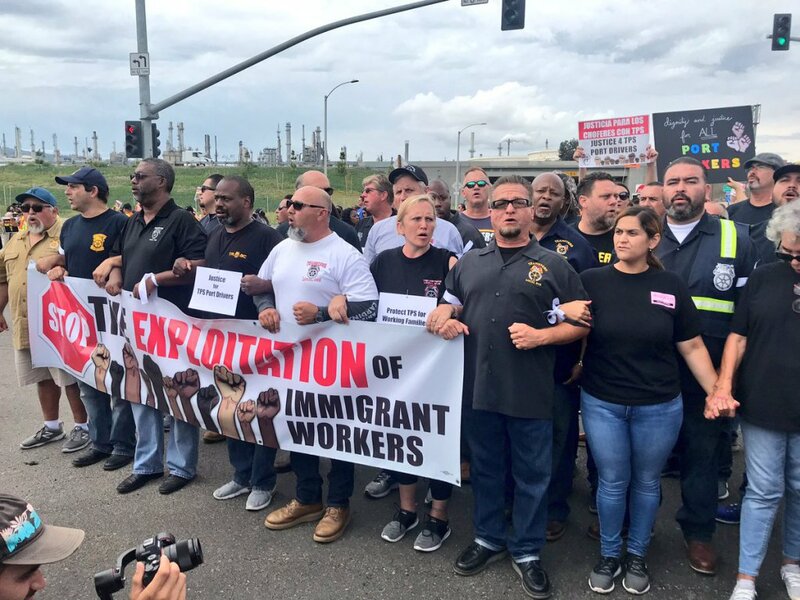 The action—in which truck drivers drove through immigration detention centers in Los Angeles with large signs reading “Justice for TPS Port Drivers”—was coordinated with TPS workers. The Teamsters union chose to support TPS because many of its union members are TPS beneficiaries. The union and workers wanted to decry the end of TPS and show that TPS workers are needed in U.S. These workers say they are a vital part of the community, working for some of the largest companies in the country on the largest receiving docks in the nation. Teamsters and TPS workers coordinated these actions during a three-day strike over an independent contractor labor dispute with XPO Logistics. The workers are trying to organize because they are considered independent contractors, even though they work for the company and perform the same duties as full-time workers. Many TPS holders are a large majority of dock and manufacturing workers. For the first time, immigrants like Maria, Erika, Pam, Suresh, Evelyn and Mazin—all from diverse countries such as El Salvador, Nepal and Sudan—are coming together on the national stage to fight for their rights. 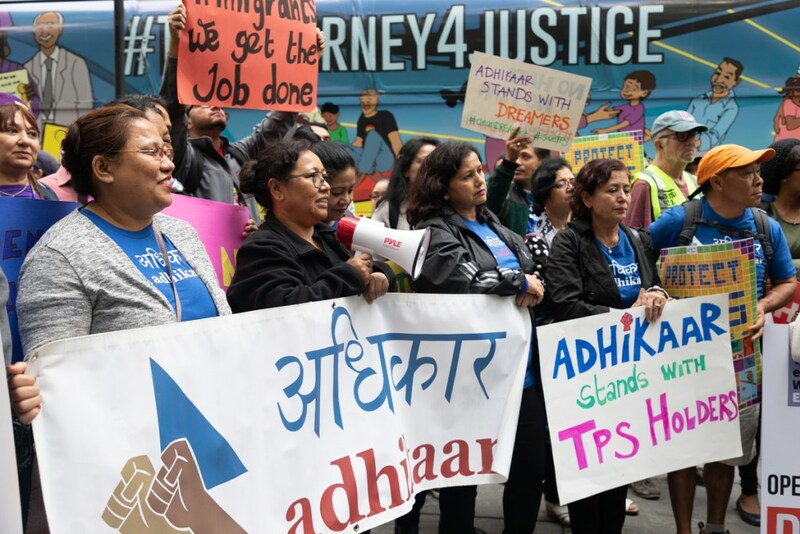 They are part of a larger immigrant rights movement working to continue the TPS program, implementing strategies to influence the U.S. public, Congress and court system.